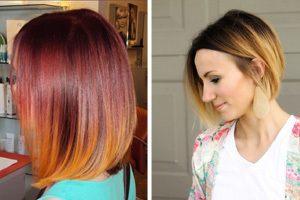 Stylish women know that as the seasons change, we need to re-evaluate our hair color. A summery, golden blonde, can look cold and draining in the gray days of autumn. Adding a touch of burnished copper in the autumn is a great way to add warmth to paler, winter skin. And if you have blue or green eyes, why not zing up your look with ice-blue, green or silver-blonde for party style? Short haircuts make it so easy to switch color! Check out the latest hair-fashion colors and plan your fabulous color update here! Here’s a super-trendy look suitable for fine to medium hair textures. It’s a very classy version of the rich copper hair color that’s so fashionable right now. Bobbed hair has razored side layers adding a messy vibe from the edgy, windswept texture. The deep, straight across fringe draws attention to the eyes. And subtle balayage in a lighter copper shade adds 3-D color depth and a very natural finish. This model has a gold-toned complexion, which is cleverly enhanced by the trendy pink and peach tones. 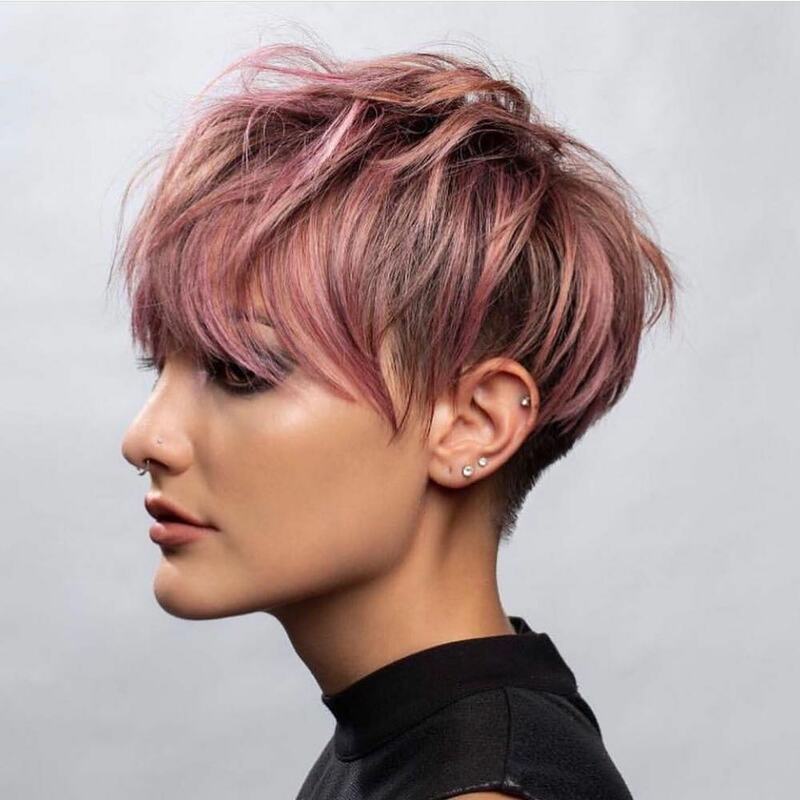 Although pink is technically a cool color, which suits cool complexions, this expertly blended short hair color design mixes in warm amber. 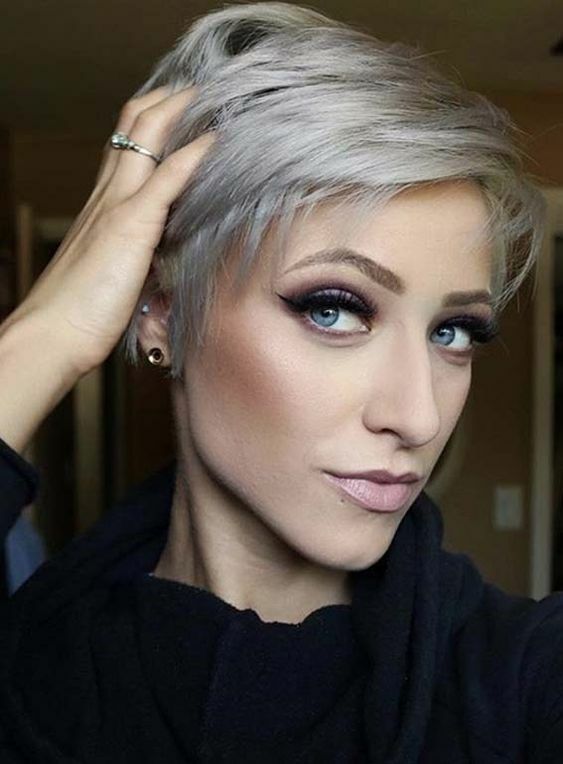 So both warm and neutral complexions look wonderful in this trendy pixie style. 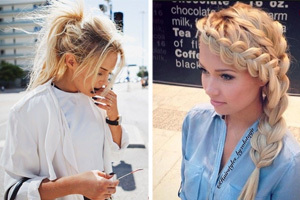 Defined strands add volume to fine hair. Adding a hint of blue-green or purple to platinum-blonde, instantly adds tons of contemporary style! 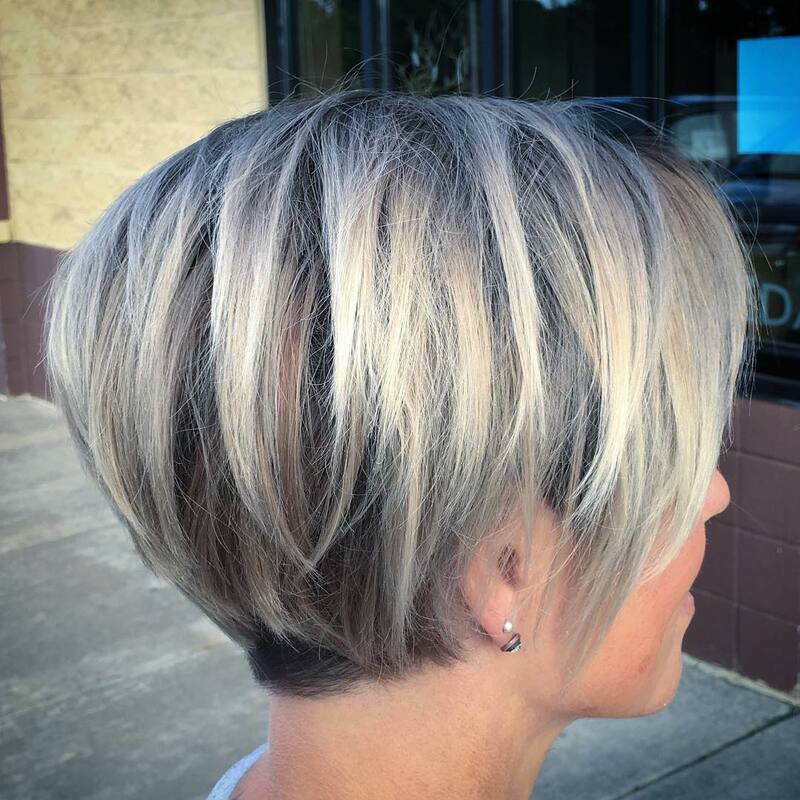 The smooth, geometric shape of this pixie is broken-up by shorter layers adding volume and texture on top. The sloping fringe suits long face shapes and blue shades suit anyone with blue, green or gray eye-color. This pretty pixie has longer layers framing the eyes and highlighting their color. Suitable for fine and medium hair. The fantastic new trend for rainbow color roots creates some really gorgeous combos! 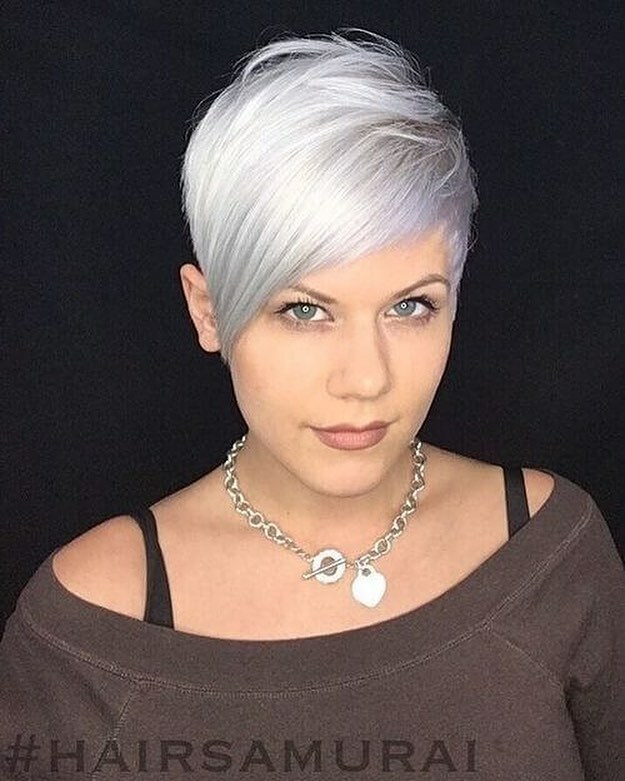 This asymmetric pixie is fresh and fun and complements a cool-toned complexion perfectly. Sliced layers create fabulous texture on medium or thick hair, which is perfect for a two-toned color design. And defined strands separate to show fabulous royal-blue roots beneath silvery-gray for super 3-D color depth. 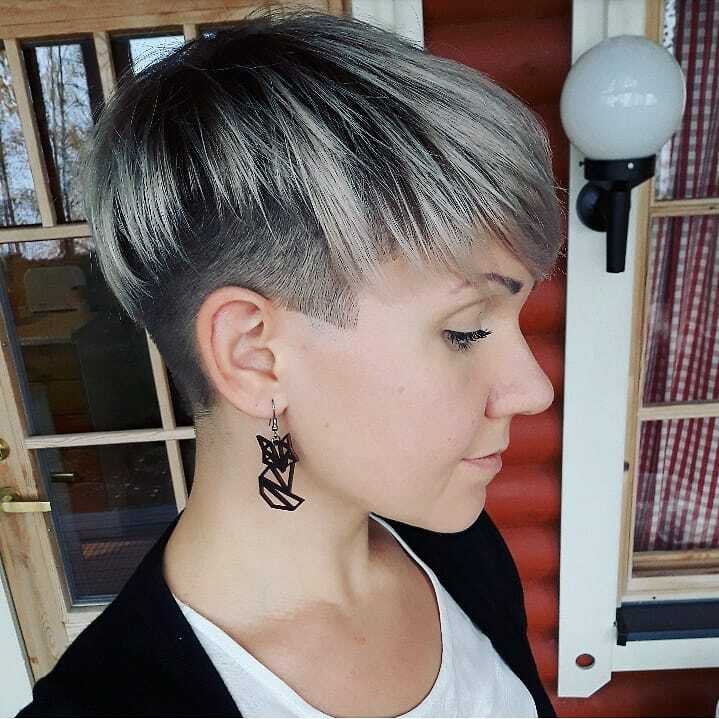 Trendy shaved back and sides add a strong geometric edge to this young, urban pixie cut. 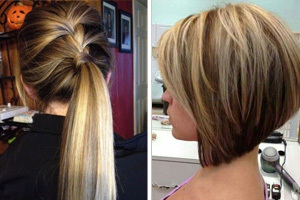 The long layers around the back create a hip two-tone contrast. And the long fringe, combed forwards from the crown, is slightly side-swept to show off well-shaped eye-brows. A natural make-up style complements the striking black and silver-blonde cut for fine/medium hair. Hide early gray on thick, coarse hair with this clever trick! 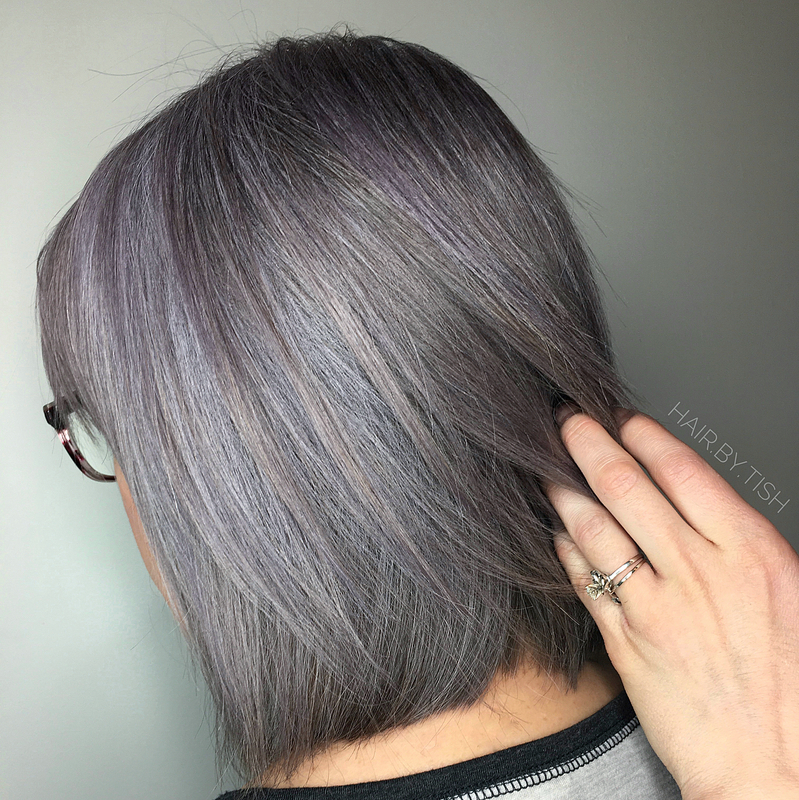 This stylish lavender and pewter gray hair color is so perfectly blended it’s youthful and super-trendy. Instead of stressing over gray, you’ll be hiding it in ‘plain sight’ in this stylish lavender bob! Pewter balayage on the surface layers adds 3-D color depth and movement. 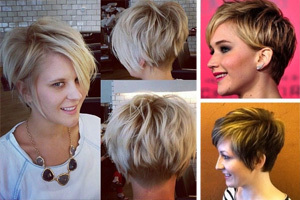 This simple, short bob cut was a run-of-the-mill ‘dark-roots and cool-blonde’ cut. 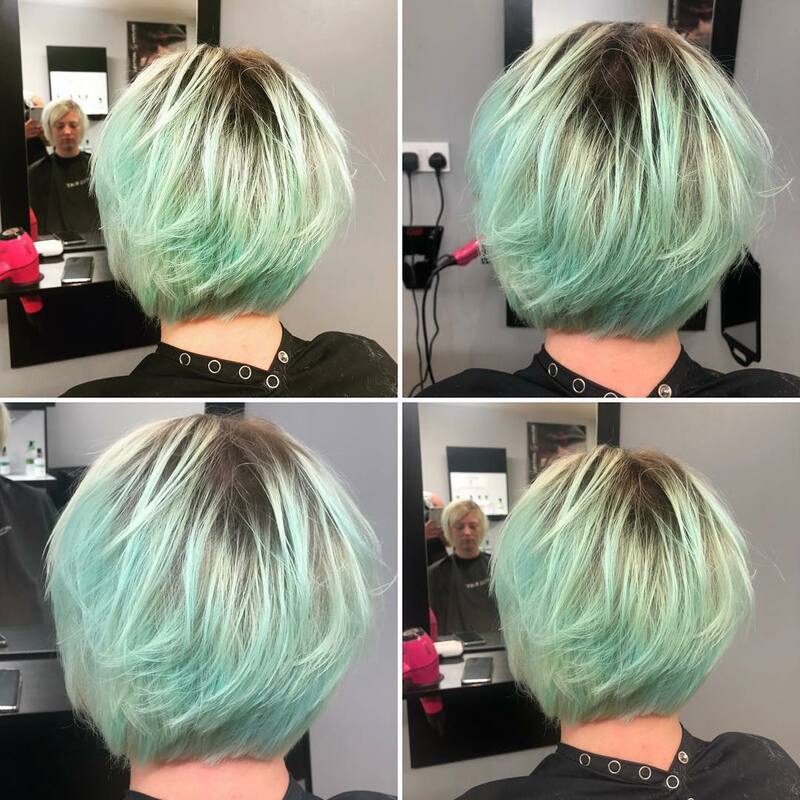 But adding a delicate sea-green color really brings the short haircut to life for a fabulous fashion statement! Styling the nape in side-swept waves adds a contemporary wind-swept finish. Suitable for fine and medium hair. 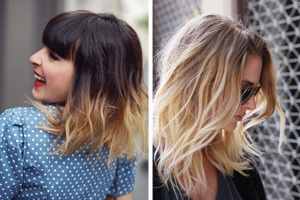 Thick hair doesn’t have to look bulky and be unmanageable if you ask your stylist for ‘sliced layers’. 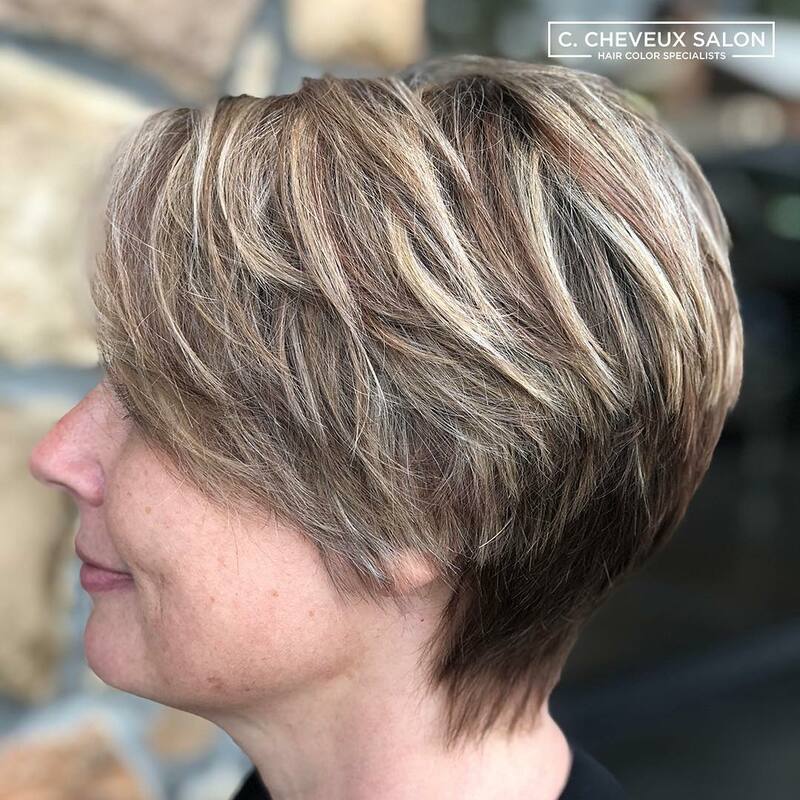 This casually tousled hairstyle has dark roots, warm brown balayage, gold and white-blonde in a marvellous color mash-up! 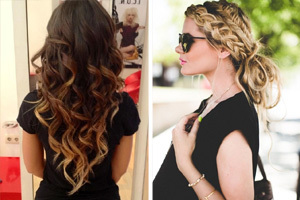 Warm up your complexion with medium-blonde streaks and warm brown balayage. The expertly blended blonde and trendy ash shades are creatively contrasted by the brown nape hair. This classy spin on the asymmetric bob is a subtle way to go blonde and lift your look for the new season! 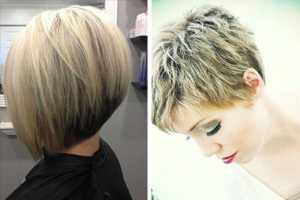 Fine hair can be difficult to style for fashion impact, but this short silver-blonde cut is a real attention-grabber! 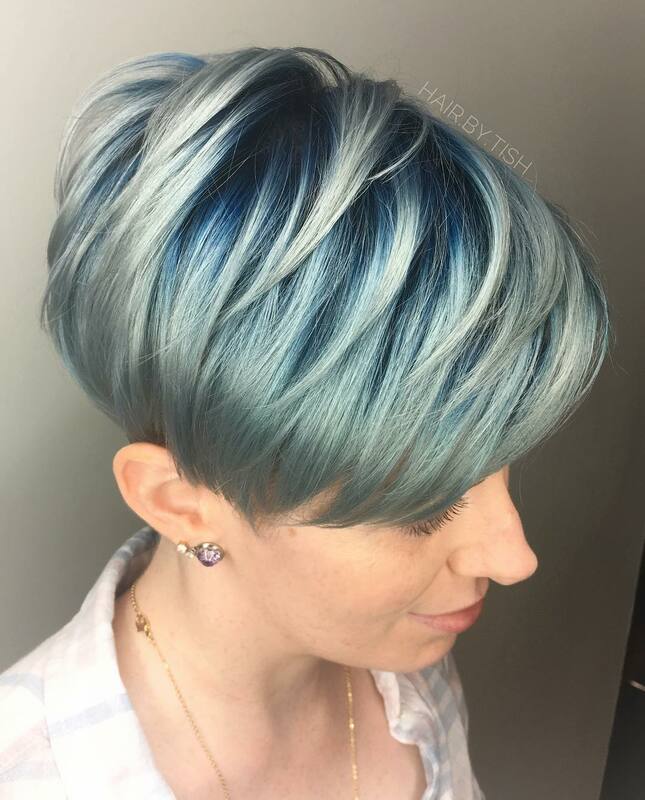 Ash-blonde highlights the top before gentle purple tones accentuate the messy, defined strands framing those beautiful blue eyes! 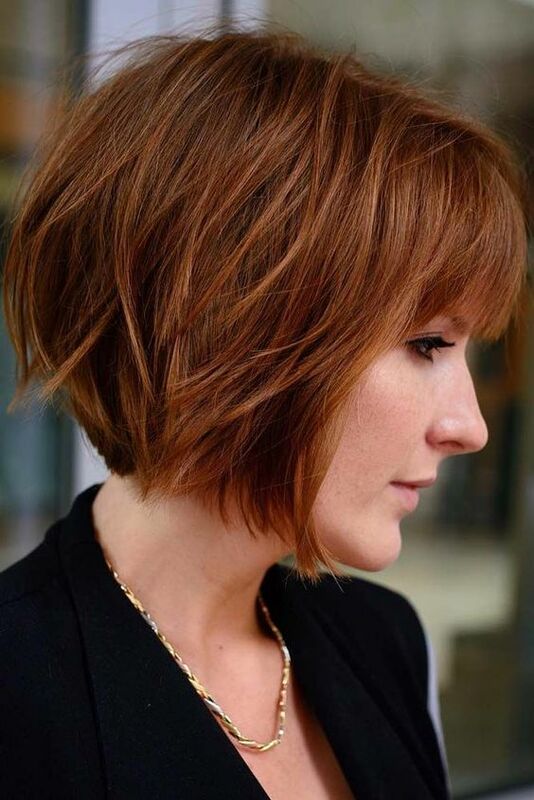 This is a super short haircut and color for enhancing pale skin with cool undertones! The key to your fashionable, new hair color is to consult an experienced colorist who knows how to complement your personal skin-tone and eye color! And remember, there are now 3 skin undertones to guide you, cool, warm, and neutral, which looks great with hot or cool hair colors!